Is Moscow being passed intelligence gathered by Austria's secret service? That is the question preoccupying the country's opposition and media amid reports that European intelligence services have distanced themselves from Vienna, fearing sensitive information may be shared with Russian President Vladimir Putin, with whom the ruling far-right has cultivated links. 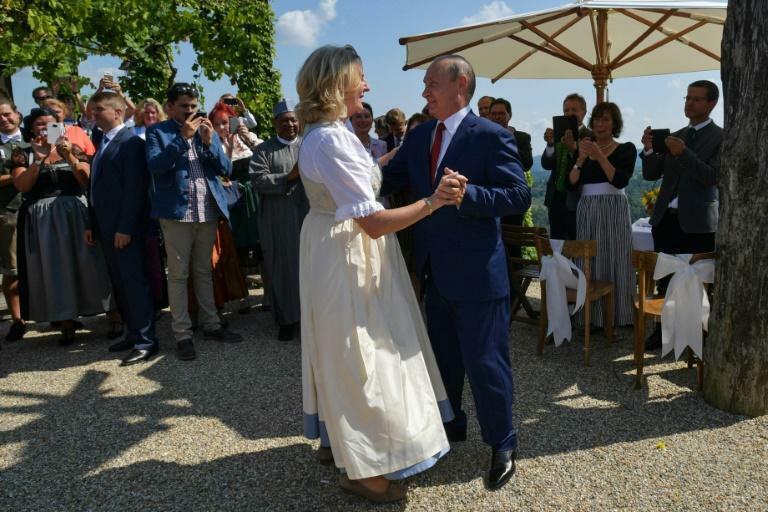 A widely circulated image of Austrian foreign minister Karin Kneissl and Putin dancing at her wedding last weekend has further fuelled speculation. Kneissl, who was nominated to the post by the far-right Freedom Party (FPOe), raised eyebrows by inviting Putin to her wedding. Both sides have insisted it was a private event. Besides the foreign ministry, the FPOe has also had the top posts in the interior and defence ministries since forming a coalition government with Chancellor Sebastian Kurz' conservative People's Party (OeVP) late last year. Putin's visit came amid reports of other Western countries becoming warier of intelligence cooperation with Austria due to suspicions that the FPOe and its Interior Minister Herbert Kickl are trying to exert influence on intelligence agencies. Unnamed intelligence officials told the Washington Post newspaper recently that police raids on the BVT domestic intelligence agency in February caused particular concern. The FPOe has had a "cooperation pact" with Putin's United Russia party since 2016. Austria's Die Presse daily on Thursday quoted an unnamed BVT source as saying that there was a fear that information shared with Austria would land straight on Putin's table the next day. BVT director Peter Gridling said in a statement earlier this week that cooperation with Austria's allies continued to "be as good as ever in important areas, such as the fight against terror". Austria, which currently holds the EU rotating presidency, is officially neutral and is not part of the NATO military alliance. It hosts numerous international organisations, including from the United Nations, OPEC and the OSCE, and in the Cold War played an intermediary role between East and West. In March, it set itself apart from a number of other EU countries in not expelling Russian diplomats over the poisoning of a former Russian spy in Britain, stressing its neutrality and that it wanted to "keep the channels of communication with Russia open". Britain has accused Russia of being behind the poisoning of Sergei Skripal and his daughter Yulia, an accusation Moscow has vehemently denied. Austria's opposition on Wednesday called for a meeting of the national security council within two weeks to discuss the concern that information may no longer be shared by allies with Austria. Jan Krainer, a parliamentarian for the opposition Social Democrats (SPOe), accused the government of compromising Austrians' security. "The Austrian secret service isn't seen as reliable partner any more," said Krainer, who is also a member of a parliamentary inquiry into the BVT set up earlier this year. The former head of Germany's secret service BND, August Hanning, warned in German tabloid Bild that "a secret service that doesn't protect sensitive secrets and the information and sources of its partners must be treated with caution". "Secrecy must be guaranteed," he was quoted as saying, although he told Austrian television late Wednesday that he had no concrete evidence of any indiscretions by the BVT.